"Yeah ... Love that Spike Jones." "Hmmmph!" Asuka hmmmphed as she came out of the shower and espied Shinji prostrate on his bed. "Just what is it he listens to on that antique anyway?" It had been a gruelingly long last dance lesson session of the day and he had hardly improved in his co-ordination. Actually it was more the girls' impatience getting the best of her rather than any shortcomings on the young mans' part. The present living arrangements were no help either. Their being cooped up together in this twin bed "hotel room" on base got on her NERVS the moment she was informed she would be imprisoned with this "animated turnip" for almost a week! Hopefully enough time to work out the unique tactics required to defeat Israfel(s), the seventh angel. Insisting on "ladies first" when it came to showering, she quickly had taken over the bathroom before he could say even one word in protest and had been in there almost a solid hour. 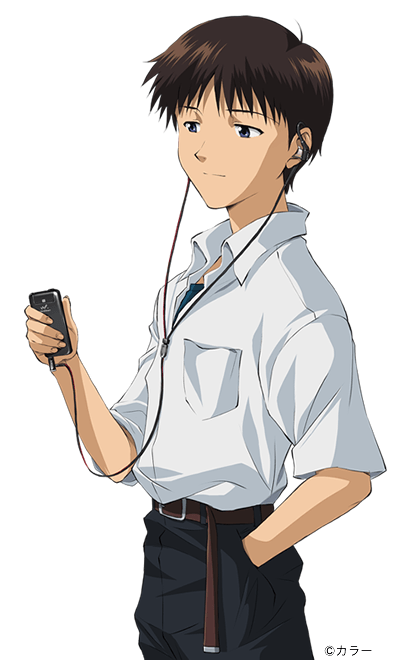 With nothing else but wait, Shinji popped the earbuds in and promptly went to sleep. Now the "obscene" tableau of a very relaxed and sweat grimed young man fast asleep greeted the fiery haired ones' now flashing blue eyes. "On the verge of the end of the world and what does he do? Kicks back with that STUPID old SDAT, Walkman whatever and drops off the planet! I ... SWEAR ... I just ...! Hnnnngh!" Ever since they met, she noticed he hardly ever parted with that old portable tape player when at home or on trips and now ... here. He seemed fine without it on missions and daytime functions. He seemed to use it a lot when sleeping or just spacing out. Just what was it about that thing he was so attatched to it? And always that one tape. "Probably some kind of dorky J-pop or ... something," the girl thought. "These Japanese have no taste in music at all!" Having already dressed in the bathroom (She'd absolutely DIE before letting the dipwad see HER naked!) she sauntered over to the low console shelves on the wall by her bed and selected a book. Straightening up she examined her selection and paused. That SDAT or rather what may be on it had her somehow intrigued. "NO! I'm NOT gonna' check it out. I'M ABSOTIVELY POSILUTELY NOT ... NOT! .... HNNNNNGH!" "It wouldn't hurt to check it out," the redhead reasoned. "Just find out ... what it is ... he listens to ..."
Reaching over she deftly plucked the earbuds from out the unconscious young mans' ears. Gaping at the screens in the monitoring room, Misato gasped. "HO-LEE ... ! NO! ... ASUKA! ... DON'T!" Launching herself from the monitors, the lilthe form of the NERV tac-ops chief mashed an alarm button before crashing out the door and down the hall. "Dear God! ... Should have told her! ... Should have told her! ... SHOULD HAVE TOLD HER! OH! GOD!" On her second door crash of the day, Misato was filled with trepidation at the sight meeting her eyes. A confused Asuka pressing the earbuds home, alternately staring in dumfounded amazement at Misato and a now twitching, gasping, choking abed Shinji. "Quick!" Misato shouted, dashing over to the bed. "Help me with him!" Tearing the earbuds off, Asuka helped prop the wheezing young man upright as Misato held him by the shoulders, shaking him awake. "You see Asuka," a concerned Dr. Akagi explained, "it's an extremely rare disease affecting the brain, symptoms of breathing difficulty similar to severe COPD. Only a few thousand cases worldwide ... The majority of which are European descent, blonde females." The redhead turned to the now slumbering Shinji. "Why didn't he ever say anything? All he had to do was-"
"He didn't want to trouble you with it," Misato put in. "You know how Shinji is. That, I guess, and possible embarrassment." Asuka lay on the bed opposite, pondering their predicament in general and Shinjis' in particular. "If only," she thought, "but then ..."
Turning she looked across the rooms' short expanse at the now peaceful form on the bed opposite, earbuds again affixed. "Breathe in ... breathe out ... breathe in ... breathe out ... breathe in ... breathe out ... "
"Congratulations! You got rid of that stupid SDAT!" Go to C V Fords' profile page and anime fan fiction list on fanfiction.net here. Go to Jays' Tee Vee blog main page here ... unless yer already there which means there are other articles under this 'un.